The first experiments with plate washers were done by the the Structural Engineer’s Association of Southern California. The author personally knew a member of the research team, and the drawing below was sketched by him. 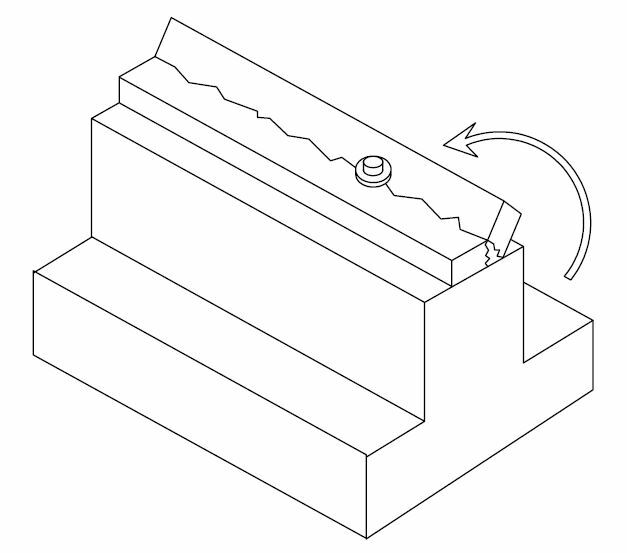 As shown in the drawing, the team discovered bolts bend slightly when an earthquake pushes on them, and would slice into the bolt like a “dull knife,” as this engineer described it. They discovered that plate washers prevented the bolt from digging into and splitting the sill. Further research done by the American Plywood Association and the American Would Counsel demonstrated that plate washers helped tremendously in reducing cross grain bending. 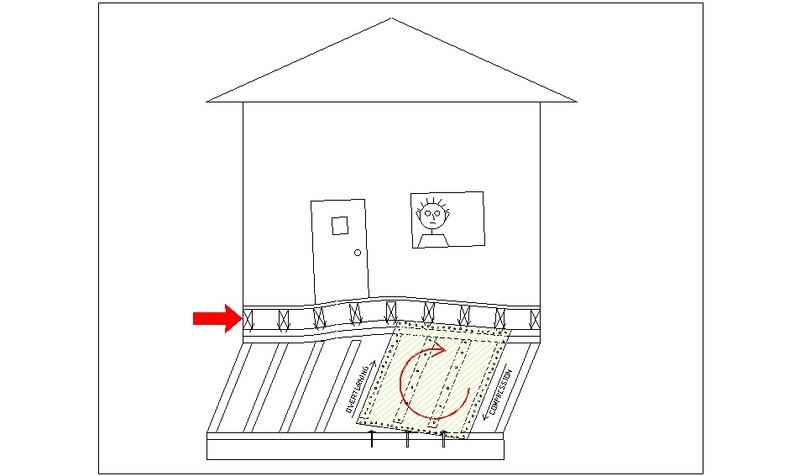 All shear walls, no matter how tall, try to overturn when subjected to earthquake forces. The taller the wall, the greater the overturning, and the greater tendency to cross grain bend. 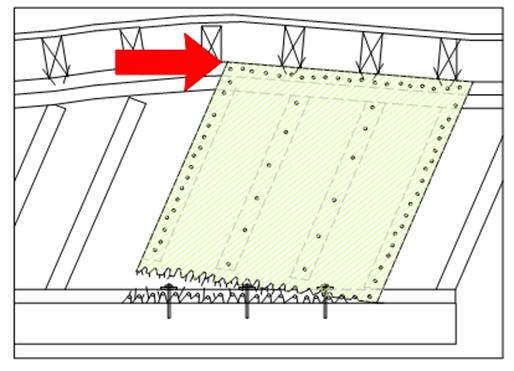 Cross grain bending will ruin a shear wall. Large plate washers as shown above greatly reduce this tendency, especially if the bolts are closely spaced. 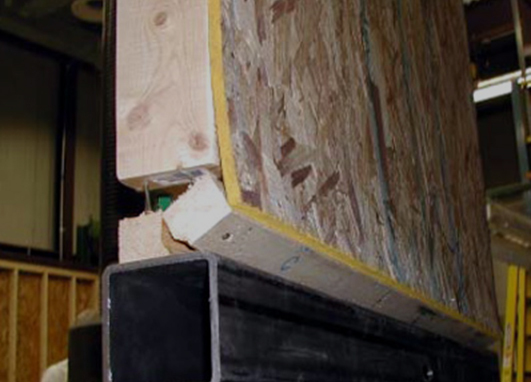 In the photo below from a test done by the American Plywood Association, the shear wall was “loaded” until cross grain bending occurred. 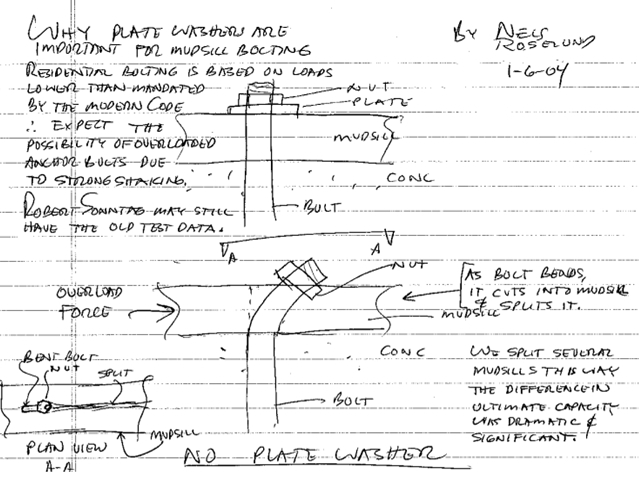 A research scientist with the American Plywood Association told the author of this article that as long as there were enough bolts (approximately 2 feet apart) with plate washers cross grain bending did not occur. Plywood Tears up on the where the foundation bolts are.